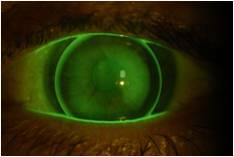 A rigid gas permeable (RGP), also known as hard lenses or gas permeable, contact lens is a lens made of durable plastic which allows oxygen to pass through, thus allowing the patient to be comfortable. The firm structure of an RGP lens permits accumulation of tear fluid beneath the lens. The combination of a smooth outer lens surface with fluid filling the irregular space between lens and the cornea results in the neutralization of a distorted corneal surface. The modern KC- RGP lens controls optical aberrations (visual static) and the larger diameter improves lens stability. Properly fit RGP lenses are comfortable for most patients and can improve vision dramatically. 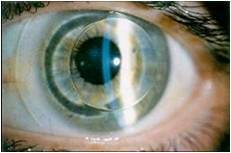 In some situations, it is beneficial to piggyback the RGP lens with a soft contact lens, which in turn serves as a bandage lens. By placing this soft contact lens under the RGP lens, the surface of the cornea is protected and the lenses may be more comfortable. These lenses are utilized for mild to moderate keratoconus and corneal irregularities.